Graphic image warning. The faint of heart may prefer to turn away now. The Estate Agent's description of this Upper West Side apartment suggests that its walls feature gorgeous exposed brick. 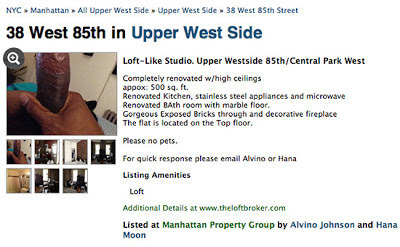 Unfortunately, one of the Agent's own photos of another gorgeous exposed, er, well, definitely not brick, was somehow included with the apartment photos and it became clear that brick was not such an accurate spelling after all. Apparently the Agent is denying that the photo is a selfy. But that just makes me worry more for his friends. Did he surreptitiously creep up behind one of them and capture the moment? Perhaps the camera was set to Auto Flash.